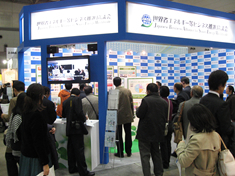 In the exhibition booth and the seminar, content of the activity of JASE-W and "Japanese state-of-the-art Smart Energy Products & Technologies" were introduced. Many businessman, General people, also trainees who had come from China also visited the booth. 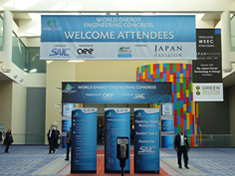 The number of exhibition companies: 8 companies in a Japanese pavilion. 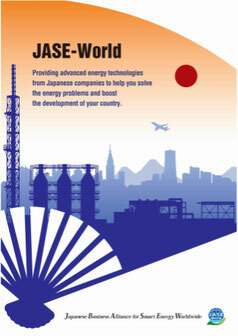 It explains the current state of CO2 in Japan, and results of conservation of energy, and it introduces outline of "Japanese state-of-the-art Smart Energy Products & Technologies" and JASE-W, the case of Yamatake Corporation (BEMS) and Hitachi, Ltd. (ESCO) which participated in this mission. We sponsored to the 3rd "Global Eco-business forum" in Shanghai(organized by Nihon Keizai Shimbun Inc.), and exhibited the panels. Our corporait menbers, Tokyo Electric Power Co.,Inc, Mitsubishi Corporation,and DAIKIN INDUSTRIES, Ltd. participated in the panel discussion. International Industrial Environment Fair was held in Bazil. It introduced the activity as JASE-W in the exhibition. The collection of the questionnaire in 36,000 people and booths was 470 in those who came. Kawasaki Heavy Industries, Ltd.,Canon Inc.,Panasonic Corporation,MAYEKAWA MFG. CO., LTD were participated in it as our the corporate members. The 2nd "Global Eco-business forum" in New Delhi was held(organized by Nihon Keizai Shimbun Inc.). We introduced "Japanese state-of-the-art Smart Energy Products & Technologies",and exhibited the panels supporting by JETRO New Delhi center. We sponsored to the 1st "Global Eco-business forum" in Tokyo(organized by Nihon Keizai Shimbun Inc.) and exhibited the panels. We lectured on the conference introduction in the summit forum that had been held.